This month's edition of BBC CountryFile Magazine carries a story I worked on last summer, with local Kendal based journalist Karen Lloyd, looking at a dying breed. Lakeland fell ponies are a rare breed of fell pony that are only kept by a handful of enthusiastic breeders, quite distinct from other similar looking breeds and said to be one of the toughest animals in the British Isles. 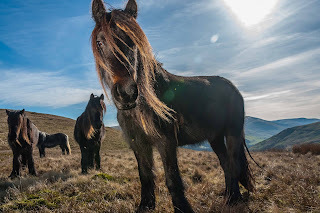 The assignment had it's moments; tracking down the ponies in the first place wasn't easy; these are wild fell ponies after all. "They could be anywhere" I was told, before mounting the back of the quad bike with an over-packed rucksack of camera kit and hanging on for dear life as we shot up the side of the fell in search of the elusive beasts. Not too elusive as it turned out. And really quite approachable, for a wild animal. Fortunately I've done a lot of horse riding in my time and I'm not really worried about them, but you never know - wild is wild. On the second visit, to a different location and a different breeder, I found myself greeting a real character who I last photographed 25 years ago on a story about charcoal burning in the Lake District. 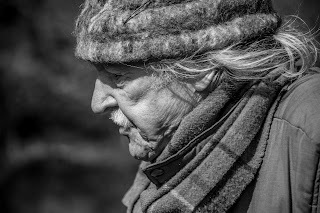 Walter Lloyd was a proper old school back-to-nature craftsman/woodsman/gypsy, call him what you like - he was an encyclopaedia of forgotten old-ways knowledge. Scraping a living but living a full life, Walter made traditional hooped gypsy caravans by hand, taught woodland crafts and charcoal burning in workshops and lived a life on the road full of adventure and surprise. And here he was again, with his son Tom, breeding rare fell ponies - of course he was. he loved horses and the horse drawn life of the gypsy traveller so what could be more natural. He looked strong and full of vigour despite a heavy bout of flu recently but sadly he was not as strong as he looked, at aged 90 something, he passed away recently. He will be missed by everyone who came into contact with him and especially by his family and friends; a true original and a proper character. 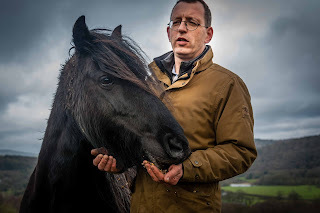 His son Tom, equally passionate about the things that were important to Walter will doubtless continue the family tradition and hopefully keep the Lakeland fell pony tradition alive. That's what all those pack horse bridges all over the fells were built for after all.